View the Alumni Association website at www.emsleaders.org. While one of the greatest successes of the Georgia EMS Leadership Program has been the members of the class, it is not the only success of this program. More than 140 of Georgia’s EMS Leaders have been positively impacted by this four-week program since its inception in 2012. New personal relationships as well as new or expanded partnerships between GAEMS, the State Office of Rural Health, the State Office of EMS and Trauma, and Georgia Southern University have been forged as a result of this program funded by the Georgia Trauma Commission. Following class one, it became apparent that the alumni of this program were a special group. What also became apparent was the desire each of the classes had to remain in contact with one another and to be able to meet and share ideas and opinions, resources, successes, and failures. 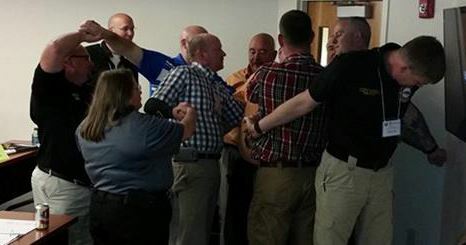 Because of this, the Georgia EMS Leadership Alumni was formed. After several months of work and conversation, the first planning meeting was held at the class cookout during week 3 of the course in Gainesville. Then in March the first organized meeting of alumni from GAEMS Leadership Alumni was held on the opening morning of the Leadership Conference. A motion was made to form an organization of alumni by members of Classes 1-4 and a committee was appointed to create the organizational bylaws. In September 2016, the bylaws were ratified by charter members during a meeting at the GAEMS Educators Conference, and the association’s first election of officers were held in February 2017. Lanier Swafford was elected chairman; Rafe Waters, vice chairman; and Chad Harrell, secretary. Vic Drawdy and Tim Grice were appointed as members of the executive committee. In March 2017, the following committees were established – education, membership, and IT. Since that time, work has been ongoing to establish a website for communications and sharing of information. The association’s website is www.emsleaders.org. Here you can find a variety of information concerning the EMS Leadership Classes as well as the Alumni Association. The website is the result of the alumni association’s collective intent to work collaboratively on behalf of EMS, and we are excited to explore all opportunities to engage our membership. In addition, work is ongoing to create a certification program for EMS Directors. More information will be forthcoming on this effort. Following graduation from the program, any alumni is eligible to (and is automatically) a member of the Alumni Association. Dues are free and attendance at our two annual meetings is encouraged. Meetings are held in conjunction with the EMS Leadership Conference in March and the Educations Conference in September. Perhaps the most important membership requirement is this – be involved. As EMS Leaders, we are the forces that will shape EMS in Georgia for years to come. Being part of a collaborative group has such great potential opportunities for our industry. A hum drum meeting with dues for no value – not here. Come be part of something that is greater than any of us individually.